Yet another great vessel. I own the smaller version being the 24cm stew pan which is in constant use. The 28cm pan is Amazing and impressive for size and volume. This cooks up a dinner for 6 pepole very easy or large batches of food for freezing down and used later. Motto Inherit Tin Lined Buy stainless steel. 577 customers found this review helpful. Did you? Yes, I did! Great for stir fries and sauteing veggies. Good family size - use it all the time. 500 customers found this review helpful. Did you? Yes, I did! I am truly delighted with my stew pan. I was going to opt for the casserole as I have had an old ceramic workhorse for 10 years but this pan does the job of a casserole and is simpler to use. The curved sides mean stirring is easier and the wider but shallower dimensions let me see what's going on immediately. It looks fantastic in my kitchen too! 610 customers found this review helpful. Did you? Yes, I did! Have recently bought a 28cm stew pan and matching lid.As always very impressive service and delivery. This pan is of the highest quality and looks really good.I have used it many times already since purchase two weeks ago. It is very versatile and can be used for frying in similar fashion to a wok the high sides help reduce fat splashing.I have used it to prepare casseroles as well as chilli and bolognese sauces and as a roasting pan the large diameter and deep sides making it ideal for this purpose.The lid allows the whole pan to balanced in the oven for slow cooking ,very useful in our AGA. The pan looks very impressive and looks well placed on the table as well.A good size to feed several hungry people. I all a great pan for a family to use. 533 customers found this review helpful. Did you? Yes, I did! I have this one in 28cm, and the smaller 24cm and they are a great size / shape combination and get used a lot. I particularly like the dual-purpose giant-frypan / in-the-cooker usage of these - and given they're not cheap in these larger sizes, that helps justify the expense. 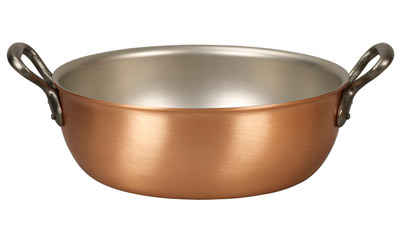 Thick copper combined with stainless lining is just about the perfect pan materiel, as lack of hot spots avoids burnt bits which improves cooking and washing up is easier too. We tend to use the 24 for everyday 2 people meals and this one for big joints or if we have visitors. By no means cheap, but really is an outstandingly good item. 622 customers found this review helpful. Did you? Yes, I did!